‘Malai Kofta’ & ME!!! :( Grrrrr… Never… Naah, never ever! As you know, I don’t much like sweets and a big NO-NO when it comes to be a sweet gravy/curry. Heat 2 tsp oil in a pan and add roughly chopped tomato n onion cubes. Add salt, turmeric powder in it and cook for 8-10 mins (or until tomatoes are mushy). Cool it down to room temp and soak cashewnuts, melon seeds in hot water for 1-2 mins. Grind them with cooked onion-tomatoes and make a smooth silky paste. Take all the ingredients (except cornflour) of kofta in a bowl and mix everything well. Make lemon-sized balls out of it and roll them in cornflour lightly. Heat paniyaram pan and add a few drops of oil in each mould. Arrange these koftas in it and shallow-fry until golden brown completely. Heat 1 tbsp of oil in deep kadai and add prepared paste along with all the spices. As it is cooked previously, add cream after 1-2 mins, give a quick stir and turn off the heat. 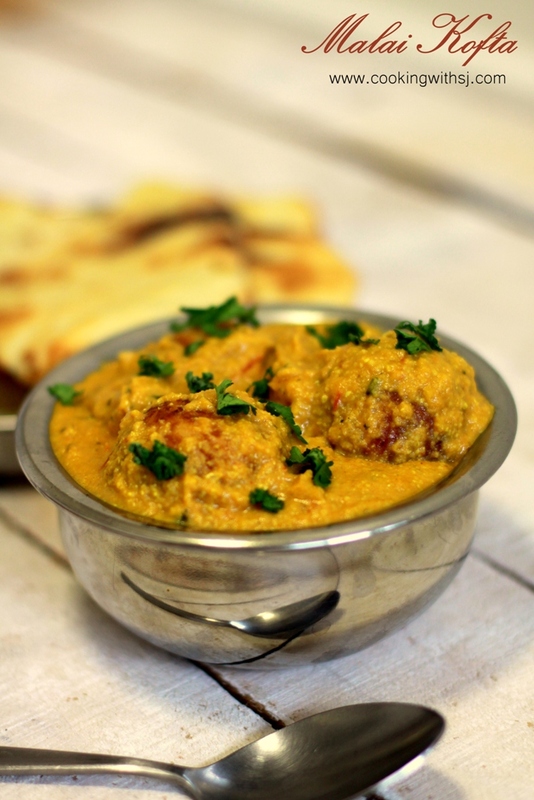 Add koftas in gravy, coat them completely and serve hot with garlic naan! It’s a bit lengthy process, but result is just too good! In case if you want to skip cream, you can add 1/2 cup Milk instead. That happens with me too that y waste money outside when ours is better. You have no idea how my mouth is watering looking at the photos. There are a few items in the ingredient that I need to go and shop for. :P droooool! Me too, not fond of curries with a sweet gravy. But now, you have tempted me to try this version of yours. Lovely clicks! lengthy yes! but I would make it any time if my family craved for it…. and they do more than required ;) A big crowd pleaser at home, this one is. 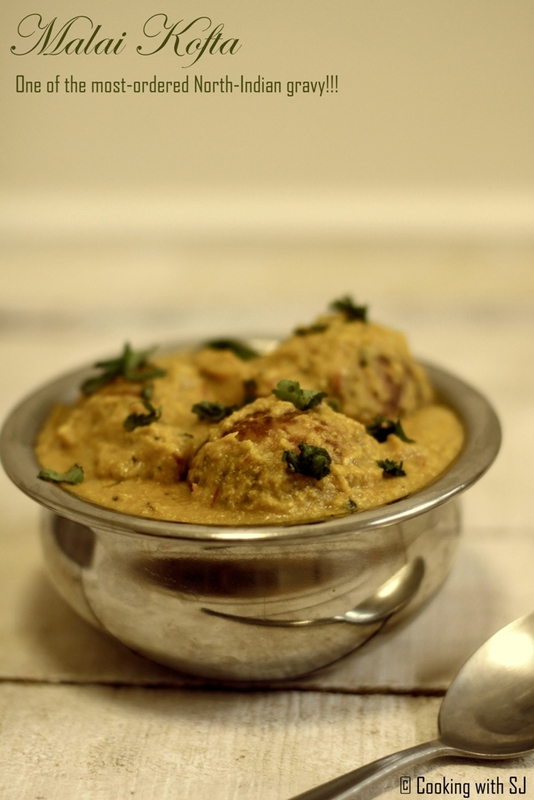 I love malai kofta but have only had it at restaurants. I’m not sure if I would be able to find the Kasoori Methi or melon seeds – are these two ingredients absolutely essential to the flavour?